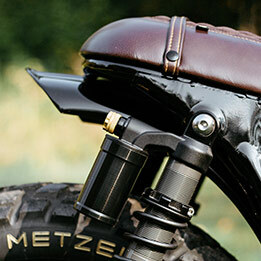 « Vintage Style Clutch And Brake Levers. For 1” Or 7/8” Handlebars. 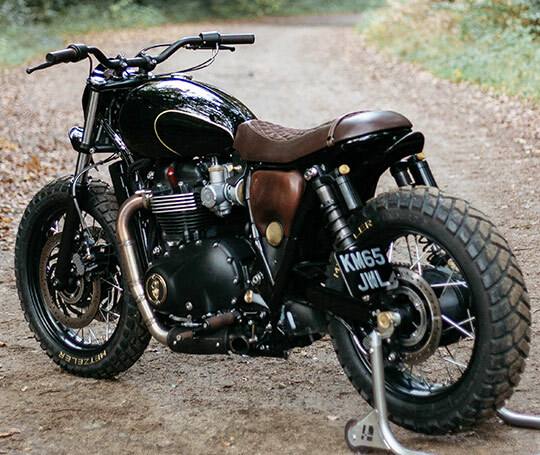 Retro Mod Triumph Bonneville T120. Back To Basics. Published by Cyril Huze December 12th, 2016	in Builders, Customs and Editorial. 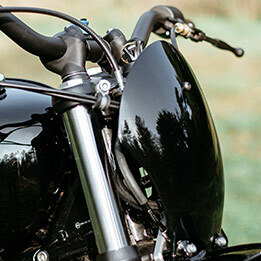 All custom builders dream of attracting the attention of a major motorcycle brand to be commissioned on a custom project. All benefit for both parties, the manufacturer getting a show piece to exhibit all year long on its new models display, and for the builder getting a huge boost of notoriety and credibility. But it’s not necessarily easier to work for a manufacturer than for a private client. The briefing may come with light or heavy restrictions regarding style and modifications, and of course you better off succeed with a project ordered to enhance the brand and/or model image. 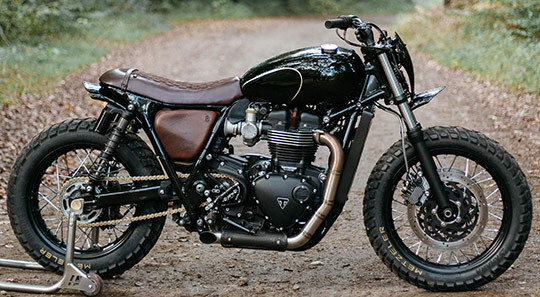 Receiving a call from Triumph may be the most exciting and stressing event of your professional life when you are a young British custom motorcycle shop. 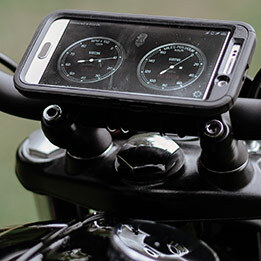 And Old Empire Motorcycles got this call… After several conference calls, the team OEM had to travel to the factory HQ for the official briefing. 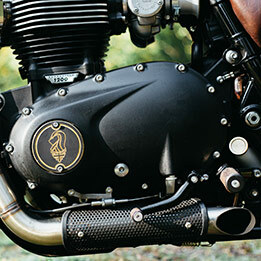 “We give you a brand new Bonneville T120. Build a piece of eye candy to be used during all the show we attend. But it needs to ride perfectly and to be available for road reviews” And Triumph added “don’t turn it into another modern Cafe Racer!” Later, the shop found out that Triumph was just about to launch the “Street Cup”, another Street/Cafe Racer in the lineup, and of course they didn’t want any image confusion between this new model and the Bonneville T120. 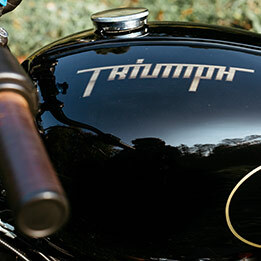 When Triumph created the Bonneville T120, the inspiration was the timeless looks of the legendary 59 Bonneville. So, its designers incorporated the original’s iconic design and features, from the sculpted flowing lines of the tank to the individual detailing of the lights and of the dual clocks. The current T120 is a 6-speed 1200 cc “high torque 8 valve parallel twin engine with torque assist clutch, switchable traction control, two selectable mode options “road and rain”, ABS, etc. 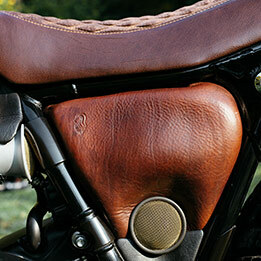 So, like many of today’s motorcycles the T120 uses the modern “ride-by-wire” technology. 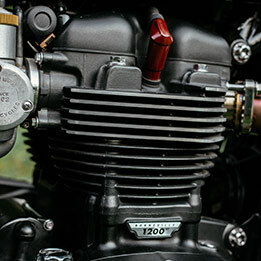 If Triumph is proud to pin-point to its potential clients the accuracy and instant throttle response of the ride-by-wire fuel injection and of its engine management system offering linear power delivery, it remains that electronics are very often the enemy of custom builders going retro and intending to return a modern motorcycle to its very basic roots and functions. First, after full disassembly and sending to the discarded bin all the non-necessary parts (except the electronics), forks were spun in the lathe and the T120 received 3” shorter fork tubes, the rear suspension being fitted with fully adjustable Fox Podium RC shocks. 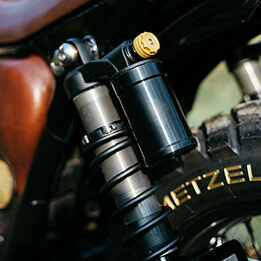 For budget reason, factory spoke wheels were kept then wrapped in Metzeler Sahara. For a retro look, fins were machined in the stock calipers, and for a lighter appearance factory disc centers were cut to give the appearance of being of the floating type. 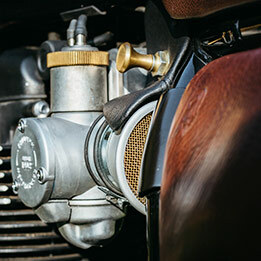 To reinforce the classic appearance, the shop installed a modified 1964 Triumph Bonneville gas tank and a pair of ribbed fenders adapted to the frame and forks. For a more racing touch , seat base had to be shortened, a job done in shortening the rear rails and loop, then a new seat pan was fabricated out of aluminum sheet. Seat foam consists of different layers of different density upholstered with brown leather and “suede”, actually a 100% waterproof luxury dog bed material. The correct bike stance being achieved, it was time to make the T120 functional again. Some very serious thinking went into finding solutions to re-integrate the factory electronics. In such a situation, on many retro custom jobs done on modern platforms, the easiest way to go is to switch off the ECU and to abandon some “non-essential” functions like traction control, immobiliser, ABS etc. Unfortunately, the new Triumph ECU is factory protected to prevent tampering, which severely limited most of the shop options. I don’t want to bore most of you with a lecture on “ride by wire” electronics, but just know that Old Empire Motorcycles found very creative ways to relocate and make most electronics work as they are supposed on a 2016 Bonneville T120 fresh out of the factory. And the merit of this creation may be more this aspect than retro styling, an exercise that OEM has proved to master on several former projects. Regarding cosmetics, this project was completed with a very unusual hand-fabricated oval front cowling, a one-off 2’’ stainless steel, pipes exhaust system covered with race car inspired heat shields, Renthal Fat Bars held by custom risers, OEM proprietary controls with integrated levers, signature dark brown grips and pegs all machined, dyed and polished to match, custom velocity stacks, a remote Rizoma master cylinder hidden under the lower plate of the triple tree, ec. The bike is finished with brown lever covers on a gloss black paint job with some gold highlights. The result is a modern Triumph with all the exquisite charm of the past to tear up the city streets (in a suit?) or race the country roads. An interesting project. Great work. 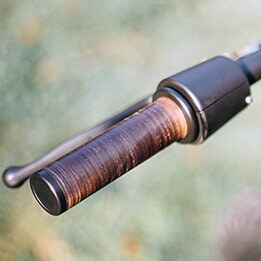 For anyone building this style of custom bike you may want to check out their unique handlebar switches and cast rear axle plates. 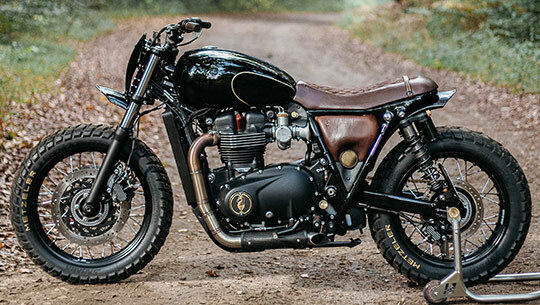 Bonneville T120 is nice too! Beautiful. 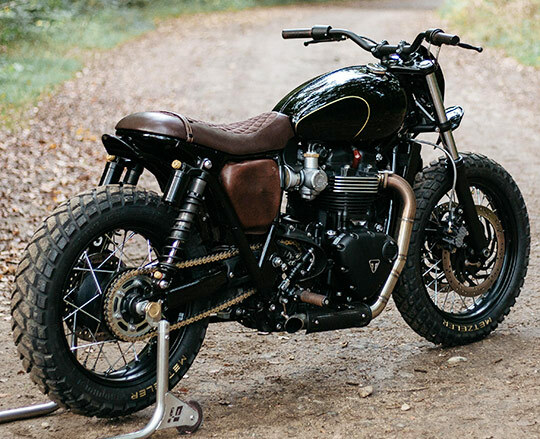 Somebody please produce that tank for modern Triumphs! Sometimes it’s easy to look at a bike too close and see negatives. The initial impression on this bike is so excellent that I just had to stop right there Great look! Great video! Trying to raise the bar on riding apparel though. Not sure how any of the modifications done to that bike could be considered “retro”, but it does seem nicely done. A look back to what it was like when motorcycling was fun and those who tinkered with them were interesting, capable people…. And a very cool scooter it is.